Looking to grow your own fruits and veggies in the comfort of your back garden? Then you’ve come to the right place! In this series I’m going to be sharing advice on how you can create a kitchen garden from scratch as well as a glimpse into our own progress. A kitchen garden wouldn’t be complete without herbs! You may have previously grown basil, mint and even rosemary on your kitchen windowsill, but if you’re creating a kitchen garden you might want to consider dedicating a whole section to herbs. There’s no right or wrong way to grow your herbs be it straight into the ground, in a long planter or in individual pots. We chose to keep ours in individual pots so that we could manage each plant separately, avoid any growing too big and unwieldy and so we could replace plants easily if they didn’t survive a particularly hot week or a late frost. Here are some of my tips for successfully growing herbs in your kitchen garden. Think about where you’d like to sit in your garden on a warm summer day. That’s probably where your herbs will want to be too! As a general rule, herbs like an open, sunny but sheltered spot in which to grow. For us that meant growing our herbs vertically on a set of outdoor ladder shelves on the patio. Find out more about our herb garden at the end of this post. If you don’t have a lot of space then pots, planters and even hanging baskets are a great way of growing herbs. Herbs do incredibly well in pots and require a lot less maintenance. There are some herbs that if planted straight into the ground will absolutely take over. Mint in particular is a nightmare and we are still pulling up baby mint plants that are growing throughout our lawn!!! Plant this one in a pot of its own. If you really want your herbs in amongst your beds then plant them in a pot that is then itself planted into the ground. This will create a barrier and stop it spreading. Particularly if you are a beginner then I wouldn’t bother growing your herbs from seed. If you want a manageable plant which is going to be kept in a pot or small planter then I would highly recommend buying a small plant from your local supermarket or a seedling from the garden centre. Check out ours below. If you are set on growing from seed, why not try this Herb Garden Seed Kit . There are two common mistakes with herbs – not watering enough and over watering! 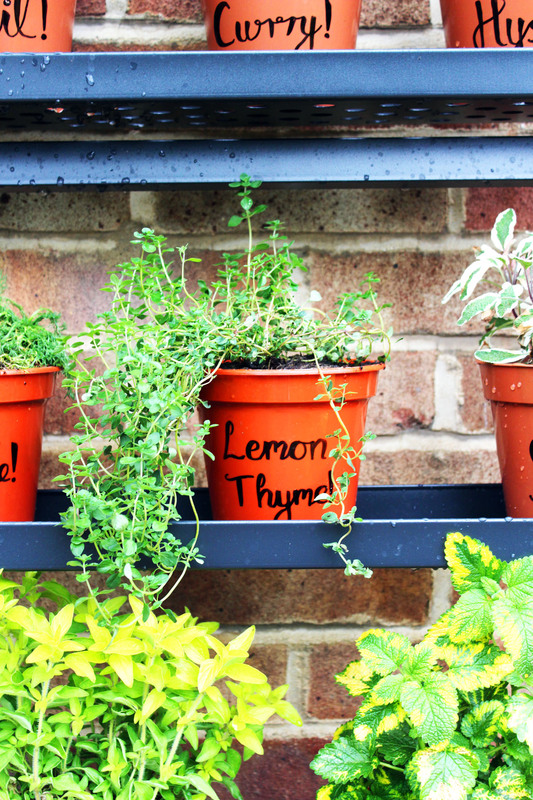 Keeping your herbs outside will mean that they are subject to the elements and of course rain! This means that the clouds will do some of the hard work for you. That being said you will still need to water them regularly. If you have good drainage (for example a hole in your pot or rocks beneath the soil) then you shouldn’t be at risk of over watering. It’s better to over water but have good drainage then not to water the enough! I can’t stress this enough and it’s particularly important if you plant in pots or planters. You put nutritious compost over your vegetable beds so why not in your herb pots too? Make sure your herbs have good compost to feed on. You can also use coffee grounds or even egg shells! This Baby Bio Herb Food is also fantastic helping your herbs to grow big and strong! Although the buds look beautiful, and I’m guilty of having chives just for their beautiful flowers, if you let a herb go to seed it will put all its energy into creating that bud and flowering rather than producing more leaves. If you see buds appear, chop them off! It’s astounding just how much water herbs need. In the summer you can easily be watering your herbs once a day. Your basil will act as a really good sign post for whether or not your herb garden needs planting. If it’s wilting give it a good drink! You will be amazed just how quickly they perk up after a good sprinkling. If you’ve got plenty of space or if you are growing in containers be brave and try something new. Don’t just pick the herbs you always cook with (like oregano or basil) try more exciting herbs like hyssop or mace. If you don’t like the taste, the chances are it will still look beautiful and add another beautiful aroma to your garden. You might be familliar with companion planting in your main garden but don’t overlook it when establishing your herb garden. Companion herbs can keep pests at bay, attract beneficial insects and polinators and even improve the scent and aroma of other herbs near by. Chamomile, feverfew and catnip are just a few herbs you may have previously overlooked which could in fact improve the overall health of your herb garden! 10. Always take from the top! When you come to harvest your herbs you would be forgiven for thinking it’s better to take the more well established leaves from the bottom but you’d be wrong! The leaves at the top are not only the most tender and delicious, but it’s best to leave the big leaves in place at the bottom as they are the best at catching the sunlight and helping the plant to grow. They are a good set of foundations and should be left well alone. 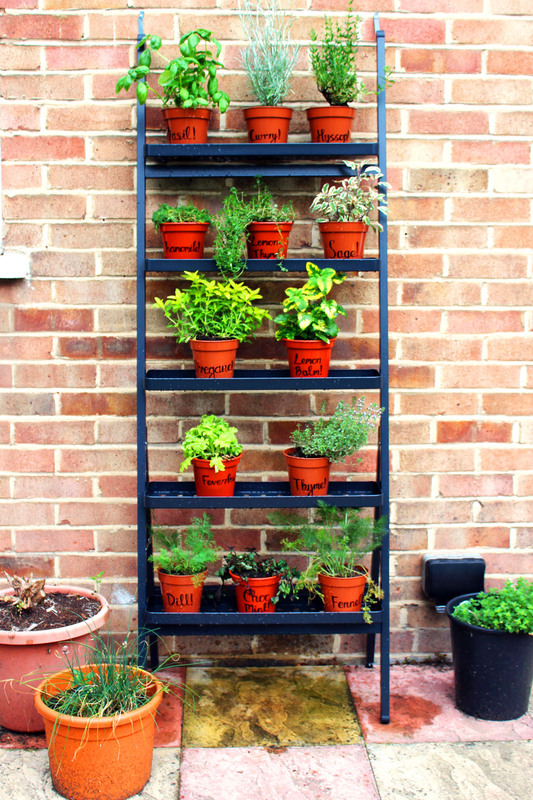 As I mentioned all the way at the top of this article we chose to keep our herbs in pots on a set of outdoor ladder shelves which we purchased from Ikea. (Check out the same shelves here). We loved these as they went with the general decor of our house (which is very much grey) but they were also ideal for growing herbs due to their drainage holes in the shelves. The herbs were potted in super cheap plastic “terracotta” pots which I decorated using a sharpie. (Though I was tempted by these colourful hanging flower pots. ) We put a few stones at the bottom and filled the pots with John Innes Number 3. I know I’m biased but I think our herb garden looks fab! 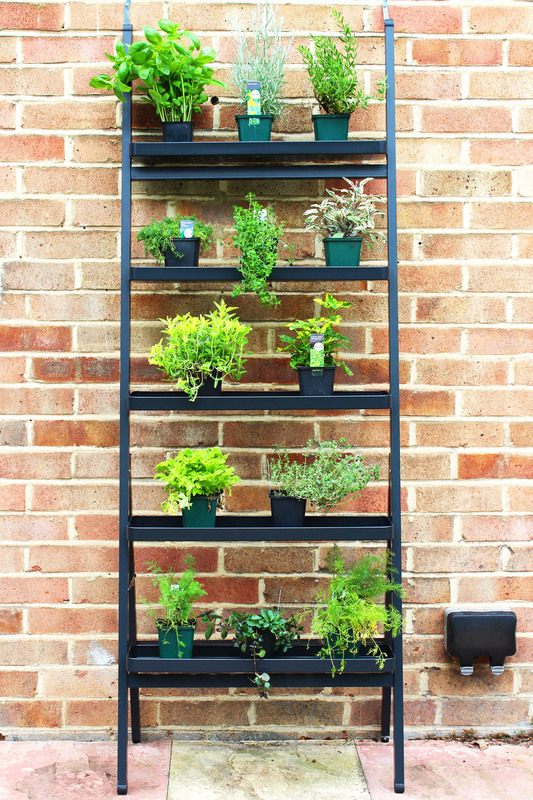 A “plant theatre” or “ladder shelves” are a great way of putting your herbs out on display. They are also incredibly cheap to pick up online or in garden centres. Some designer home-ware stores will try charging you a bomb for these, particularly if you want them extra beat up and “vintage” looking but a few English summer days with sun and rain will sort that out for you in no time. If you want something a bit more practical then I can’t recommend our Ikea shelves enough. We’ve currently got 12 different herbs on the go including classics like basil and oregano but also some more interesting herbs like chocolate mint and lemon balm. I’m also particularly excited about cooking with our curry plant! Bonus tip: why not consider planting a “companion herb” like fever few to keep bugs at bay! Because our ladder shelves are right next to our backdoor they are ideal for picking a few sprigs when we are making dinner or as a garnish to a cheeky cocktail! Keep your eyes peeled as I will be sharing lots of herby recipes over the coming months including a roasted red pepper and basil pesto soon! Do you grow herbs in your back garden? Do let me know if you have any tips or tricks! If you’ve enjoyed this post please do make sure you tweet, Facebook or pin it for later.